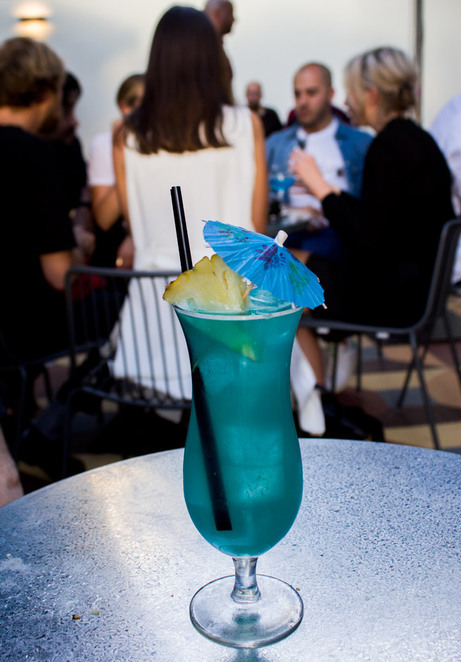 The hottest new rooftop bar has just opened in the centre of Melbourne. 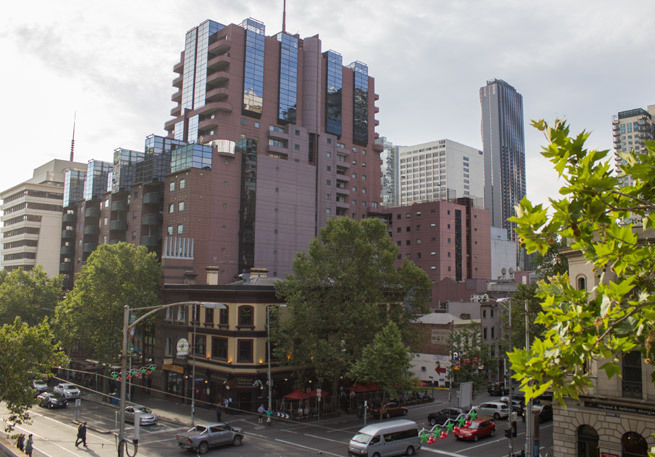 Perched above the recently opened Fancy Hanks Restaurant, which boasts a great selection of slow-cooked American barbecue style food, Good Heavens offers a bar with views over Russell and Bourke Streets. 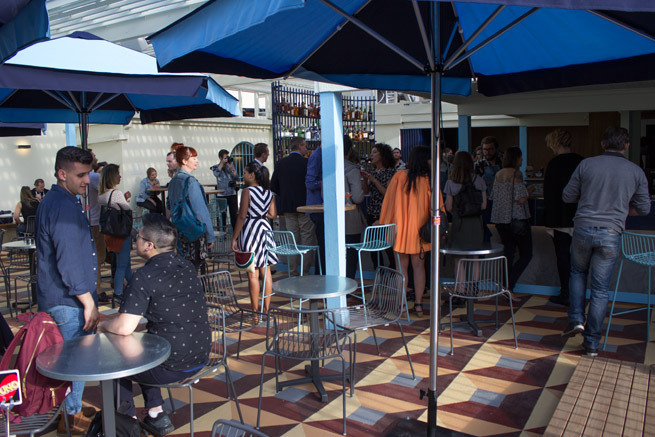 The bar is partly under cover and partly open air (with umbrellas available). It's a large space for a bar of this type (licensed for 200 people), offering an impressive number of tables and chairs. I can see Good Heavens quickly becoming a favourite place for an after work meet up, a pre-theatre drink, or of course a pre-dinner drink before you feast on some brisket or pulled pork shoulder at Fancy Hanks. And speaking of drinks, there is a large, most impressive and very well stocked bar which offers a wide range of drinks, including beers, ciders, wines and an extensive cocktail list. On arriving at the bar, we first saw the oh-so-pretty Electric Blue cocktail and had to try it. Comprising Tito's Texan Vodka, West Winds Sabre (gin), Olmeca Tequila and Havana Club Anos (rum), Electric Blue packed a punch that will have you zinging in no time ($18). There are also a number of classic cocktails with a twist, like the Good Mai Tai which features three types of rum, along with its tropical juice flavours ($18). If cocktails are not your thing, there is a wide range of wines from $9 per glass, pages and pages of spirits and liqueurs, and beers on tap as well as a 'bottled beer' page with many local and international options including Sixpoint Crisp Lager ($11.50 for a 300ml bottle), Lost Coast "Sharkinator" White IPA ($11 for a 355ml bottle) and 3 Ravens Dark Smoke Ale ($9 for a 330ml bottle). There are also some bar snacks available at reasonable prices. The nachos (brisket mole, queso) ($15) were disappearing off the plate at a rapid rate, as were Hank's cheeseburgers ($9). I enjoyed the fried cauliflower (vegan ranch dressing, hot sauce) ($8). 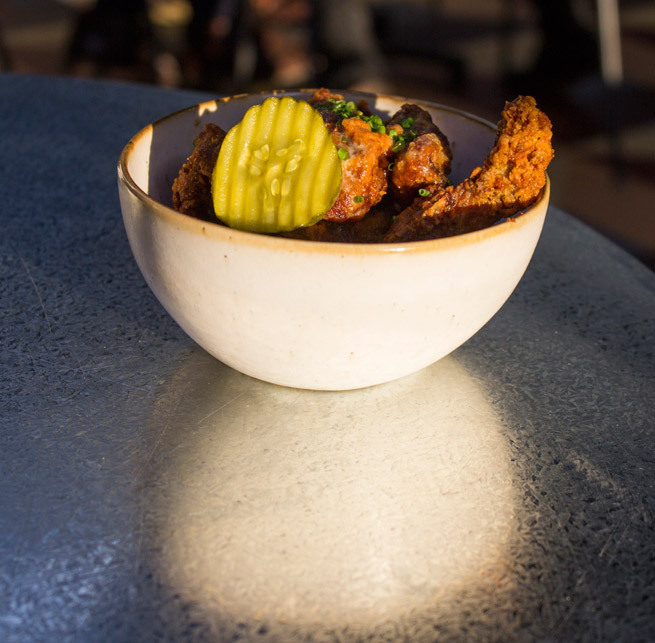 If you're a spice fiend, you'll love the Southern hot chicken ribs (buttermilk and honey) ($12.50), but make sure you have a drink to go with them! There will be music via a DJ each weekend. Check Facebook or Instagram for updates on the DJs playing over summer. 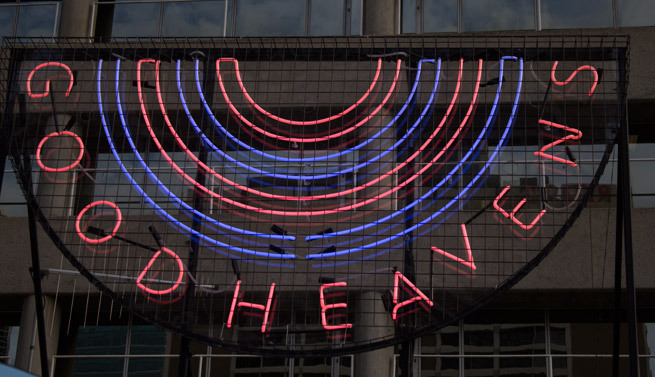 Good Heavens is located at 1/79 Bourke Street, Melbourne. It is open seven days: from 4pm to 1am Monday to Thursday, and from noon until 1am on Friday to Sunday. The images in this article were taken by the writer. They are not to be reproduced in any form without the express permission of WeekendNotes. Why? A bar with a view - and amazing cocktails.